Bay Area music fans.... this is a good one! 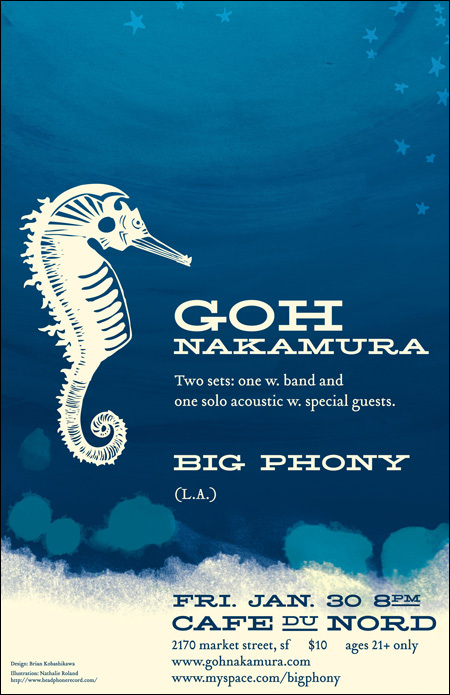 Tomorrow night, don't miss local favorite Goh Nakamura celebrating his birthday with a fun show at Cafe Du Nord in San Francisco. Opening the show is singer/songwriter Bobby Choy, aka Big Phony -- his first time ever playing in the Bay Area! Goh tells me he's actually been a fan of Bobby's ever since he first learned about him right here on this blog. Awesome. If you're in the Bay Area, come out to the show, bring a friend, spread the word. It's Friday, January 30, at Cafe Du Nord. For more information about Goh and his music, visit his website here. For more info about tomorrow night's show, go to the Facebook event page here. If you like good music, you should definitely go.